The most significant improvement for the STOC members was the creation of the WEB page by Michael Galassi. The Internet had finally come of age and it was becoming easier for people to retrieve information. Michael did an excellent job of collecting everything that had transpired in the past and designed and maintains the WEB page for us. Another significant improvement for the STOC members was the creation of a "list processor" where any one member could email his/her questions or comments to the entire list of people on the list with only a single message. We thank Mike Morrison for this improvement. If you search the Internet using Yahoo for motorcycles, you'll find the STOC WEB page listed... We're famous. 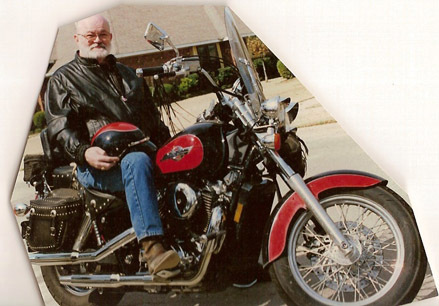 The December 1995 Motorcycle Consumer News (MCN) reader survey (page 36) form lists the STOC as one of the choices for current motorcycle organizations of which you may be a member. I can think of no greater tribute to those who have been involved in the making of the STOC than to see the "organization" recognized in a national motorcycle publication. I know Derek Catt is smiling down at us for our accomplishment. 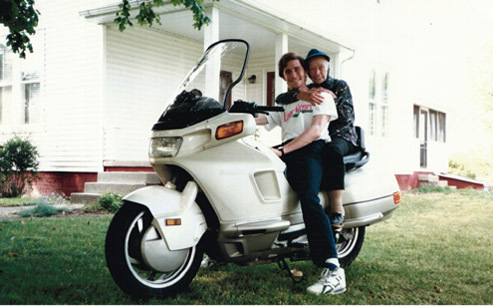 STOC cofounder, Derek Catt, #001 and his 97 year old Great Grandmother, circa 1992.